The row out to Yellow Bluff and the GG Bridge is a very popular option for rough-water certified rowers, and it’s not very far, In breezy summer weather this may be your best option for a long row. The area has its special risks that you should be considering, however. A row to Yellow Bluff and back covers 8.4 kilometers/5.2 miles/4.5 nm. The row to Yellow Bluff is essentially an extension of the row along the Sausalito Downtown. That row turns around at the Sewage Plant, the limit for novice rowers. Rough-water rowers will continue past the plant into smoother, more protected waters an additional kilometer ( or 0.5 nm) to the prominent bluff that is Yellow Bluff. This area will experience light to moderate tidal currents, especially during an ebb flow, and some tide-generated waves are common. In general, however, the water up to the point will be relatively calm and easy rowing. If you extend beyond the point, however, you will want to be cautious of the tide. A strong ebb flow will contact the shore here and set up a rip that can get suddenly rough at the point. Don’t preceded past here without considering the challenge of pushing back against that current in rough water. Look before you go, and consider if the ebb is building or fading. The round trip to the GG Bridge and back to OWRC covers 11.2 km / 7 miles or 6 nm. Another kilometer’s row past Yellow Bluff brings the rower around Point Cavallo into the bay in front of the Golden Gate Bridge (called Horseshoe Bay on some maps). This is a great place to visit on a flood tide (you rowed there on a flood during your Rough-Water checkout) but it is a very different place on an ebb tide. Think twice before proceeding beyond Yellow Bluff on an ebb, and on many such days the best option is to turn at YB or row elsewhere. You may find a moderate current opposing you as you pass Yellow Bluff. Just stay close to the bluff to minimize it. Watch out for long casts from the fishermen on the rocks at Pt. Cavallo, you can get caught up in their lines if you are really close. You will find very light current in the small bay outside of Ft. Baker, perhaps a mild back-current towards the bridge, and one can get close to Lime Point and the opening to the Golden Gate in calm waters and observe the flood coming in through the Gate. Remember that you must not proceed past the bridge unless accompanied by a coach or with an OWRC clinic. Unlike the flood, an ebb current can get rough along the shore past YB and will get into the fore-bay area. You may have a tough row getting out of here back to Richardson Bay. More ominously, the current runs fast along the shoreline from the large pinnacle rock to Lime Point. This current will try to pull you into the main current and out past the bridge. Turning around here can be difficult, so if you come here on an ebb, make your turn around early, well clear of Lime Point. At peak ebb current this is a difficult and risky place to row. Think about turning at Yellow Bluff to row back towards Richardson/Cone Rock. Extending the row out to the #2 mark nearly 2 kilometers, in a direct line extension of the Sausalito channel, brings you to the #1 mark, a large green buoy that marks the northern edge of the shipping channel. This route is open and exposed, so it will be rough with a wind from any direction, but can be very pleasant on calm days. You will find current in this area, both ebb and flood can reach several knots here, but the tidal flows are not especially rough. 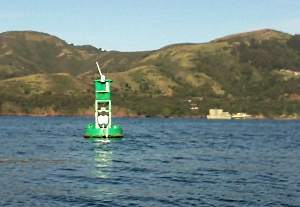 One kilometer further southeast is the mixed red/green buoy that marks Harding Rock. This shoal is the southern boundary for the shipping channel, which means that the gap between the #1 and Harding Rock is the shipping channel. Do not enter the shipping channel without carefully checking both ways for oncoming shipping. If there is a ship in the channel do not enter, but wait at the buoy for the ship to pass. The vessels move deceptively fast and can cover the distance from the GG Bridge to you more quickly than you can cross the channel. Err on the side of caution. Most of the time, happily, there is no ship approaching and you can safely cross the channel and visit Harding Rock. Tidal currents here can get “lumpy” as the flow moves over the underwater obstruction, but a rough-water certified rower should find nothing here unmanageable. The area is popular with seals and porpoises also. You are really “out there” at HR, miles from any land, which can be either exciting or daunting, depending on your comfort level. It’s a pleasant row on a calm and clear day, but obviously not a place to go in fog and low-visibility conditions. Harding is also an important landmark on the route out to Alcatraz.